The event spans three Seattle waterfront parks: Centennial Park, formerly Elliott Bay Park (North Entrance), Myrtle Edwards Park, and Olympic Sculpture Park (South Entrance). Once you get into Seattle and get down to Elliott Street you are gonna drive over the Galer Street Flyover. At the stop sign you’ll make a right turn. There will be another stop sign as you drive under the overpass. Our traffic folks should be there to direct you on to the Band Check-In booth where our Band Load-In Crew will meet you. They will get you to your stage. Also, each performer will be automatically given a Stage All Access Pass and a Stage Guest Pass at Band-Check-In. Any additional passes must be worked out in advance. Don’t lose your pass, we have to laminate thousands of them by hand! Once you get dialed in you will have to park your car. There is limited on site parking so give yourself plenty of time! You may need to park off site and walk in after unloading. Please carpool!! Don’t show up 20 minutes before your performance if you really want to perform. You should give yourself two hours before your gig time to get passed in! The best deals on lodging can be found here. Perhaps the best way to get to Hempfest is by bike. Myrtle Edwards Park is part of the Elliott Bay Trail which connects to the massive Burke Gilman Trail. One may easily navigate the regional trail system from Sammamish, Lake Forest Park, Bothell, Kirkland, etc. BICYCLE RIDERS and PEDESTRIANS: Mon-Thurs before Hempfest, and Mon-Wed after, from 7:30-8:30 AM is vehicle free time on East & West paths of Myrtle Edwards and Centennial parks. 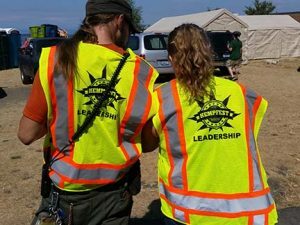 Hempfest vehicle traffic is suspended for that hour during weekday set-up and tear-down to respect morning bike commuters who use the parks. For public safety, BICYCLE RIDERS MUST DISMOUNT during Seattle Hempfest. ALL DAYS, ALL HOURS. Bicycles should enter through the North entrance in Centennial Park to utilize the bike racks, or use the bike racks at Bay and Elliot. Attaching bikes to the fence at Olympic Sculpture Park is not allowed. Interstate 5 runs through the heart of Seattle. From either direction, take the Mercer Street exit (Exit 167) towards the Seattle Center, home of the Space Needle. There are pay parking garages and lots in downtown Seattle (see below) and in nearby Queen Anne. Street parking is free after 8 p.m. and and is free all day Sunday. Myrtle Edwards Park has no parking. Pier 70 at Broad Street and Alaskan Way. Located on the corner of Vine Street and Elliott Avenue. parking. Evening and weekends only. Most of you plane people will touch down at SeaTac International Airport, which provides non-stop service to numerous cities ranging from Missoula, Montana to San Francisco to Amsterdam. The Port of Seattle has useful info on getting downtown from SeaTac. One may may hop the easy Link light rail direct from the airport to downtown or take Metro to downtown. Shuttle Express offers shared-ride van service to downtown from the third floor of the airport garage. Some hotels offer shuttle service also. Kenmore Air provides seaplane service from Lake Union to various parts of Washington and British Columbia, and landplane service from Boeing Field. Metro Transit provides local (countywide) bus service. A number of bus routes stop in downtown Seattle. Once downtown, just walk downhill to the waterfront, turn right and follow everyone else to Hempfest. Metro operates numerous park and ride lots throughout the region. To beat the crowds, use the north entrance by crossing the new Amgen Pedestrian Bridge off of W Prospect Street. Modeled after the double-helix geometry of DNA and crossing an expanse of train tracks, the pedestrian bridge is hard to miss. It has an elevator and is wheelchair accessible, placing the avid attendee just north of Hempfest’s north entrance. The following Metro routes stop nearby: 15, 18, 19, 24, 33, 81. Sound Transit provides regional bus service. They provide service south as far as Dupont, north as far as Everett, and east as far as Issaquah. Greyhound provides nationwide bus service. Rates are decent, and bus rides are interesting. Reserve 14 days in advance and rates are $20-109 dollars one-way anywhere in the U.S.
Seattle Hempfest happens north of Pier 70 on the waterfront near several public and private ferry services. The Washington State Ferries run several routes around Puget Sound. Pier 52 hosts the Bremerton and Bainbridge Island routes, and Pier 50 hosts the Vashon Island passenger only ferry. King County Transportation provides passenger only ferry service between Pier 55 and West Seattle via the Elliott Bay Water Taxi at Seacrest Dock. Victoria Clipper operates a passenger only ferry between Victoria, BC and Seattle. Operating from Pier 69, it’s a bit pricey but those jetfoils make it the fastest ferry service around. For ferry service between British Columbia and Washington, one may also use the private M.V. Coho passenger and vehicle ferry service. This lands in Port Angeles on the gorgeous Olympic Peninsula. To get to Seattle from here, one will need to take a ferry from Bainbridge or Bremerton, or head south to the Tacoma Narrows Bridge and back up I-5. The Alaska State Ferries have (costly) service to Bellingham. 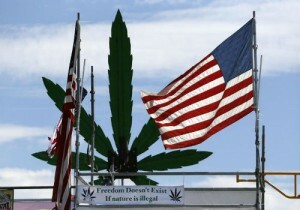 One may also take a cruise ship to Hempfest, should one be so inclined. Five cruise ship companies operate from Pier 66 and Terminal 30. For those sailing from afar, the Port of Seattle operates three marinas with guest moorage. Bell Harbor Marina on Pier 66 has 80 guest slips. Shilshole Bay Marina is the city’s largest marina with 100 guest slips. Fisherman’s Terminal also has some guest slips, but requires a pass through the locks. From either Shilshole or Fisherman’s Terminal, Hempfest is a quick bike ride away. For the local boaters, nothing beats Hempfest by boat. Just set your course for the downtown waterfront and you can’t miss it. Boaters from Lake Washington and Lake Union must pass through the Ballard Locks, which are open from 7 a.m – 9 p.m. Don’t be a stoner and miss the closing of the locks. Amtrak provides nationwide train service. Seattle is on three of their routes: Coast Starlight (Seattle to Los Angeles), Empire Builder (Seattle to Chicago), and Amtrak Cascades (Vancouver to Eugene). Trains stop a bit south of downtown at King Street Station. Sound Transit provides regional commuter rail service Monday through Friday, which might nice if you’re staying the weekend. There are two routes, one south of Seattle and one north. The train goes into Seattle early, and leave Seattle after work hours. Southerly, one can ride the train from Tacoma, Puyallup, Sumner, Auburn, Kent, and Tukwila. To the north is a gorgeous waterfront ride to Everett and Edmonds.